Roulette LED Circuit using 555 timer IC, before starting the tutorial let you know about what the roulette is, it’s a casino game named after the French word which means little wheel. As same, here we are making a wheel (or circle) shaped led blinker, using 555 timer IC placed in Astable mode, and IC 4017 which is decade counter IC and small needful components. 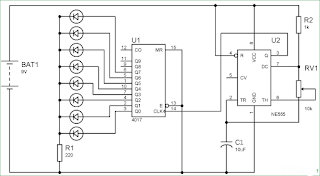 12 CO –Carry out Used to cascade another 4017 IC to makes it count upto 20, it is divide by 10 output PIN, we can count how much we want just by cascading the ICs through this pin and every IC will generate 10 outputs. 13 CLOCK inhibit In operating condition this pin will remain at Low, beacause if this pin is High, will stop the pulse generation means it will be in freeze mode. 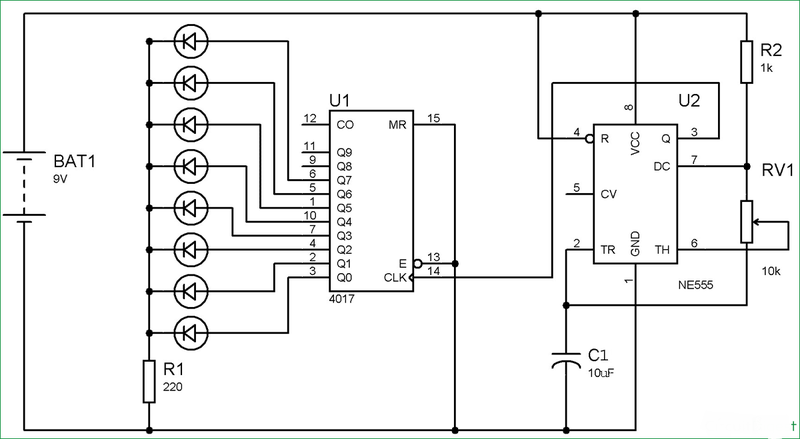 0 Response to "Best Roulette LED Circuit using 555 timer IC | LED Blinker Circuit Diagram"